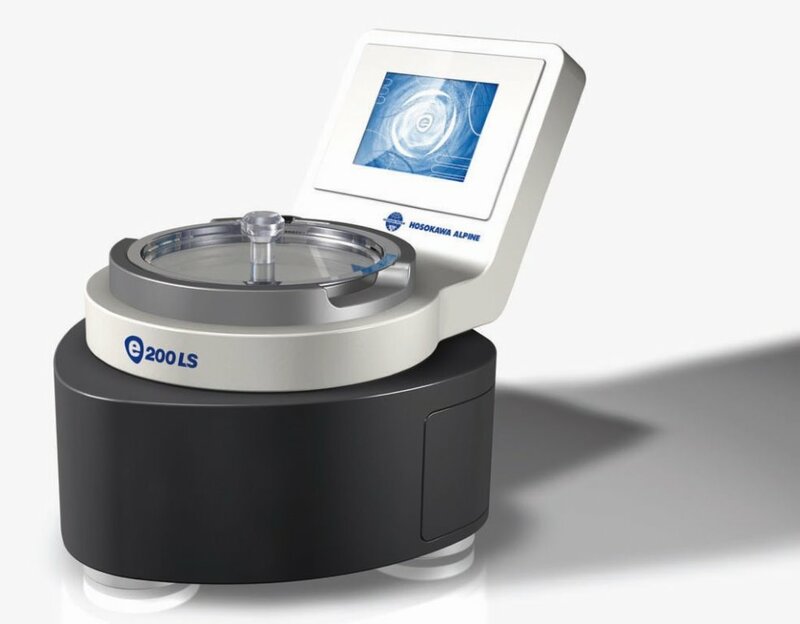 The new, Hosokawa Viblette VBL-F, wet sieve analyzer is launched this month and is seen as the modern standard to replace conventional wet sieving methods in dry particle size analysis. The simple to use Viblette VBL-F offers sieving times a third less than conventional sieving methods whilst using only 1/6th the liquid to produce accurate and reproducible particle size analysis required in quality control operations. 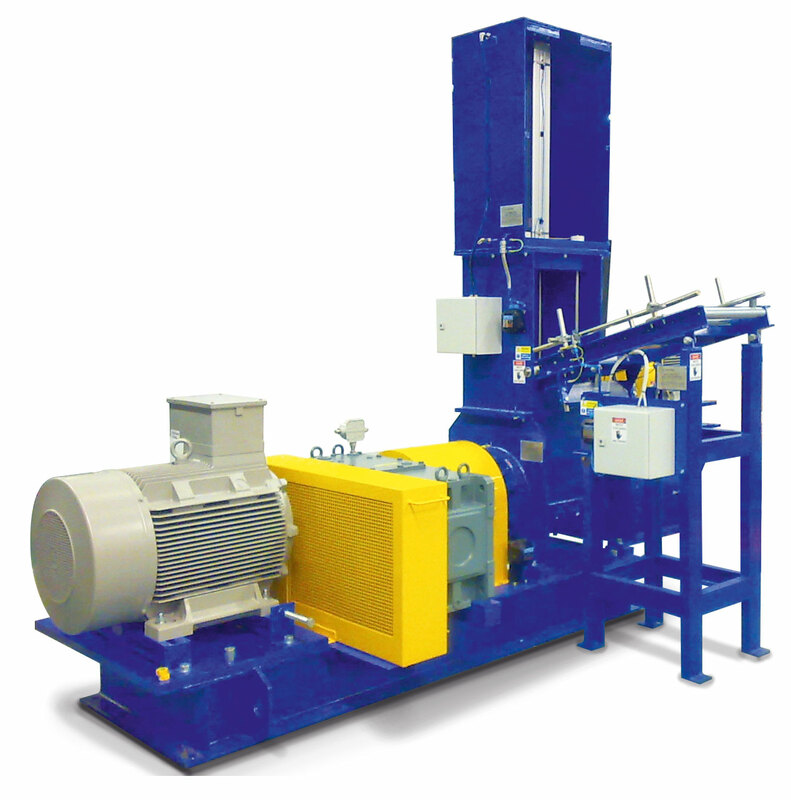 The unit offers a 5 micron, non-filming screen wet sieving capability. Wet sieving is an established method where cohesive or highly electrostatic powders are to be analysed and where small amounts of coarse powders are to be isolated – which is difficult to detect by laser diffraction- scattering methods or dry sieving. Enhanced vibration allows rapid analysis and unique shower nozzles deliver effective powder wetting with little liquid waste. Liquid is sprayed through shower nozzles onto the powdery sample on the sieve. The sprinkler is rotated by liquid pressure evenly wetting the powder. The problem of fine screen filming that can occur in wet sieving is avoided using enhanced vibration force, allowing both fine particles and liquid to pass through the screen and shortening the measuring time. Manual intervention is not required during sieving. Options are available for ultrasonic operation for high cohesive, superfine powders; for organic solvents as well as a series of control options of spray timing, flow volume, rotational speed of sprinkler, process time and vibration on/off timing. Typical powder applications include, carbon black, calcium carbonate, graphite, silica, plastic, food, abrasives, ceramic fine powders. Hosokawa Micron’s unique Angle Disintegrator, with 5-a day, streamlined processing options is helping manufacturers of soups, purées, sauces and dressings meet the market demand for increasingly authentic and quality fruit, vegetable purées and demand for the flavours of exotic and often difficult to handle spices and fruits. This multi-tasking machine offers 5 different processing options in one machine: pulping or blending; coarse or fine purée; hot or cold ingredients; wet or dry ingredients and rejection of unwanted plant matter or injection of water, steam or inert gas. By eliminating peeling and chopping operations and by continuously removing unwanted fibres, skin particles and seeds to produce an homogenous, puréed product processing steps and product handling are reduced to deliver a higher quality, fine textured, end product. Garlic, root ginger, tomatoes, onions, oranges and vanilla pods can all be pulped and puréed using the Micron Angle Disintegrator with reject material ejected through a secondary outlet to leave a pristine, homogenous purée. Selection of coarse to fine end product are easily achieved by the changing of removable screens. 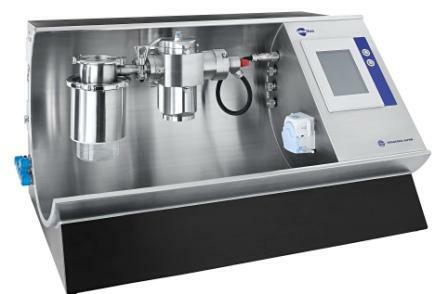 Capable of handling dry or soaked ingredients the Angle Disintegrator is equipped with a water injection system making it suitable for continuous mixing and blending – the option to inject steam or inert gas during operation is also possible. With a capacity to handle up to 3000kg/hour of either wet or dry, hot or cold products the hygienic construction enables fast product changeover without cross contamination. A downflow booth design standard for companies seeking affordable downflow booth options that don’t break the bank but which still retain the high levels of containment and personnel protection is proving popular across a range of processing industries. Customers say the performance is what they would expect from a more expensive booth. 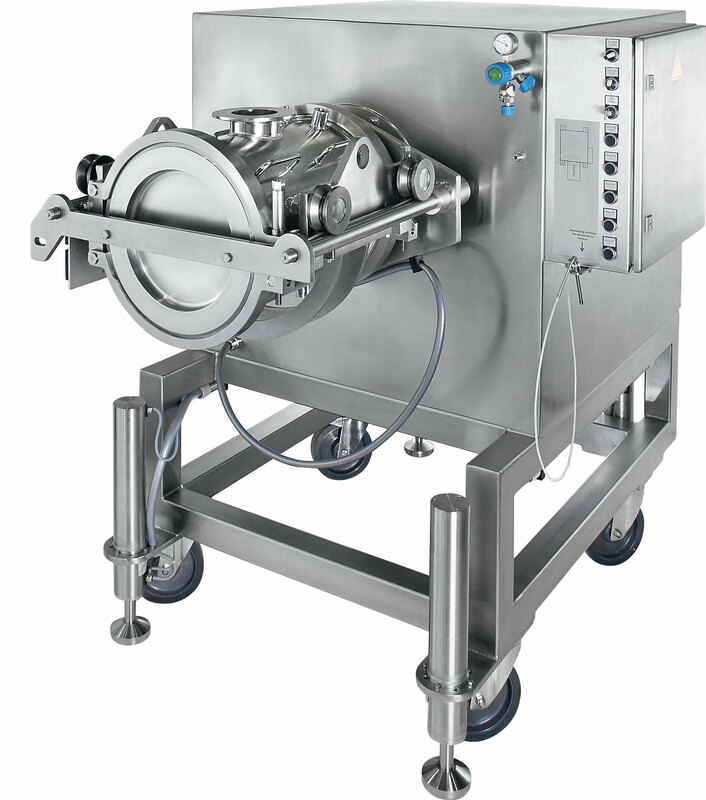 The Downflow Booth is suitable for handling powders or liquids and with a full, front opening retractable roller door is suitable for storage as well as multiple dispensing activities. Designed for ease of installation and flexibility of operation the new Downflow Booth is ‘plug and play’ requiring no complicated installation or qualified personnel to undertake the wiring work. By utilising EC plug fan design and technology air handling efficiencies have been achieved alongside easily adjustable fan speed control that allows for efficient air handling within the working environment. With noise levels of sub 60dba the booth is ideal for positioning within ‘quiet zones’ or within multi-processing areas where high noise levels might be unacceptable. When speciality fabric manufacturer Vlisco approached Hosokawa Micron Ltd seeking a contained drum handling solution to provide a physical barrier between the operator and product to protect their workforce from contact with airborne, fabric dye particles, they were explicit in the challenges that needed to be met. These including the safe handling of drums of various sizes and the de-lidding, opening and emptying of drums into a reactor vessel within a contained environment. Hosokawa Micron engineers responded with a bespoke designed drum tipping glovebox, built around the dye reactor vessel, that met all the customer’s requirements including an Operator Exposure Level of <5 µg/m⊃3; to protect operators potentially harmful dusts. Drums and kegs of different sizes and weights are presented to the glovebox on a roller track and manually moved into the glovebox before being connected to the drum tipper. Drums are de-lidded and bags opened before special container clamps suitable for handling a range of weights/sizes attach the drums to the lifting/tipping device. The drums are then automatically lifted, rotated and dropped onto the reactor where they are located into position to secure and reduce dust creation on discharge. The system is operated under a nitrogen blanket to minimise dust explosion risk and is engineered for ATEX compliance with drum lifting and rotation operated by intrinsically safe air motors. As the reactor vessel contains hydrochloric acid, special coatings are applied to the glovebox chamber and plastic parts were used to make up the filter and extraction systems utilising plastic fans, pipework and plastic coated valves and filters. As an original and heritage textile design company, Vlisco welcomed Hosokawa’s bespoke approach to providing a purpose designed containment solution that reduced both manual handling of drums and operator risk. Michiel Soolsma, Process & Quality Engineer, Vlisco says, ‘From the first contact, Hosokawa made a great impression by understanding our problems and coming up with possible solutions. Although we needed more time before starting the project, Hosokawa showed patience and assisted us when asked. From the start to the end of the project Hosokawa showed their experience and engineered a glovebox that is operator friendly and could be integrated in our new installation. 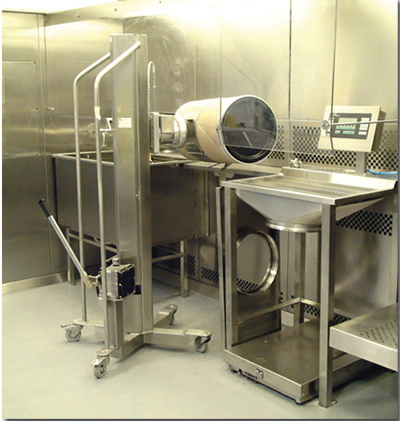 In the pharmaceutical industry the downflow booth is one of the most widely recognised means to protect workers when handling dusty materials or undertaking activities that generate airborne particles. Keeping workers safe from dusts and fumes that can damage their health is a legal requirement under Health and Safety at Work, COSHH regulations across all industries and the user friendly working environment offered by downflow booths as an alternative to cumbersome PPE, combined with the high levels of protection they can afford, has led to the adoption of this clean air technology across chemical, food, healthcare and other industries. Matt Wilby, Maintenance and Commissioning Engineer at process containment specialist, Hosokawa Micron Ltd says, ‘However downflow booths can only fully protect those working in them if they are regularly monitored, inspected and maintained to preserve their installation performance levels and comply with safety regulations. Routine monitoring demonstrates the unit is performing to established, safe, commissioned standards. It provides invaluable historical data and enables prompt remedial action if required and forms an inclusive part of a scheduled programme designed to spot and handle deviations that may place operators at risk. Daily visual checks such as checking for panel damage and failed lighting are a start point and can be done by the operator, who probably knows the unit better than anyone. Keeping records is crucial in demonstrating that the system performs as it was designed. Failures detected or deviations identified should be logged, reported and acted upon. Training of your maintenance team will be offered by your downflow booth manufacturer at equipment handover. Training should be geared to the performance levels, activities undertaken within the booth and tailored to accommodate specialist maintenance operations outside your in-house capability and scope. Smoke tests verify containment and that airflow in the booth is flowing in the right direction and that it is not compromised by the placement of equipment and that smoke remains within the safe work line and none flows into the outside area which would indicate a risk to those in adjacent work zones and potential product contamination. Where cleanroom or controlled area classification verification is required in accordance with BS EN ISO 14644-1:1999 airborne particle count testing is required. This is undertaken using light scattering instruments to determine clean zone cleanliness. DOP testing of HEPA filters forms a part of the regulatory requirements and should be carried out by experts to ensure reliability. This test determines if your filters are performing to the standards acceptable for your operations. The test provides assurances for all parts of the filter including the seals and the housing. The statutory requirement for testing intervals is 14 months with the test carried out in accordance with BS EN ISO 14644-3:2005 or PD 6609:2007 by test engineers capable of identifying and resolving leakage problems. ‘A planned maintenance programme prevents equipment failure and production interruption whilst keeping your downflow booth safe to use. We recommend companies look at packages from OEMs which offer scheduled visits to undertake a full range of checks and tests to industry standards as well as full IQ/OQ recertification of your system. Compliance documentation provision is also an advisable option. Service intervals should be recommended by manufacturers, take into account HSE guidelines, how your downflow booth is used, how much product passes through it and help determine the framework for a preventative and predictive maintenance schedule to meet your H&S obligations. For example a downflow booth operating on a 24/7, three shift dispensing line will require more frequent servicing than a booth which handles a few sample tests per week. Any remedial work deemed necessary would be carried out at this point by the service provider – including filter replacement.’ explains Matt. 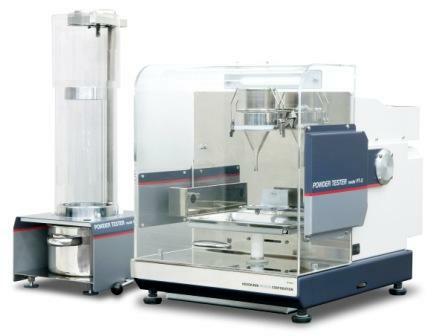 For companies seeking to improve product quality control, process design or optimisation or wishing to undertake new materials development, the Hosokawa Powder Characteristics Tester PT-X is a ‘must have’ piece of laboratory equipment that is now a ‘can have’ essential; thanks to Hosokawa’s no deposit, fixed payment funding option. The Hosokawa Powder Characteristics Tester can determine 10 separate powder characteristics essential for high specification powder production and design of powder handling and processing systems. Examples of popular use include, accurate determination of flowability which would effect mixing speeds and an understanding of the critical discharge flow to prevent product bridging on discharge from a vessel or the influence of moisture content on flowability. The easy to use PT-X features clear visual displays, speedy analysis time with minimal operator intervention and high levels of test accuracy and repeatability. Hosokawa’s new, help-to-buy funding gives manufacturers immediate access to the benefits of product and process improvement that can deliver speedy pay back potential and opportunities for business growth, development or diversity. Hosokawa Micron Ltd recently beat stiff competition to win the order for a fine milling system to suit the rigorous demands of UK based contract chemical processing company, Exwold Technology Ltd. With an exacting requirement for a pesticide formulation milling system able to achieve throughput rates of 900kg/hr and a particle top size limitation of 15 microns the customer awarded the contract to Hosokawa based on their technical expertise, project management capability and most appropriate equipment supply to meet the target requirements. ‘The customer specialises in formulation and processing for the Crop Protection and Speciality Chemicals markets, providing toll processing services on a worldwide basis. We were happy to support through extensive product trials carried out at the Hosokawa Alpine test centre to ensure correct mill selection and operating parameters to meet the customer’s needs,’ explained John Buck, Area Sales Manager, Hosokawa Micron Ltd. Hosokawa Micron supplied a 630 AFG Fluidised Bed Jet Mill with integral 315 ATP Classifier which is capable of producing the top size requirement with extremely tight particle size distribution. This configuration gives the customer highly efficient and accurate particle sizing across the high volume throughput. Product is fed to the mill by screw feeder via a double flap valve to ensure an accurate, modulated flow of material and maintaining the integrity of the 10 Bar containment. Once milled the product is collected in a filter. As standard within an agrochemical plant the stainless steel construction milling system is fully ATEX compliant and built to 10 Bar pressure resistant design. The crevice free design of the mill and integral classifier helps ensure full product evacuation whilst the WIP nozzles allow easy cleaning for contamination free production between batches. Engineers at Hosokawa Micron Ltd have literally taken their latest glove-box developments into another dimension as a result of the company’s recent collaboration with the European Space Agency. Working closely with scientists and engineers at the Universitat Autonoma de Barcelona, Hosokawa has developed a pilot plant habitat (Pilot Plant Compartment V) in the form of a high containment glovebox and gas loop system. The Compartment V glove-box has been designed, built and installed by Hosokawa Micron as the final piece of the jigsaw in the MELiSSA Pilot Plant to provide a habitat for the development and demonstration of regenerative closed loop life support systems, paving the way for deep space travel. The project also offers potential solutions for today’s global challenges such as waste recycling, water provision and food production in harsh environments. The MELiSSA project (Micro-Ecological Life Support System Alternative) depends on biological processes and understanding of how these may be affected by reduced gravity and cosmic radiation. For cost and safety reasons the MELiSSA Pilot Plant is a ground based, closed loop support system with a ‘crew’ of rats. Later developments will involve humans, in preparation for future space missions. 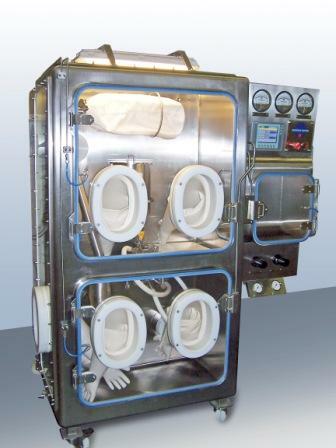 The Glove-box system represents the crew compartment and allows regeneration of the habitat atmosphere (loaded with carbon dioxide exhaled by the animal crew) and control of an oxygen fraction set-point. Part of the habitat atmosphere is circulated through a photo-bioreactor, where photosynthesis converts carbon dioxide into oxygen. The experiments carried out rely on having a ‘gas tight’ environment and the entire system was designed to achieve a leak tightness of less than 0.03% volume per hour (equivalent to a pressure loss of 0.3mbar/hour). Hosokawa Micron Ltd announce the development of the high performance cooling type, mechanical mill, the Micron Glacis GC fine grinding mill. Suitable for fine grinding of heat sensitive products, the Micron Glacis GC is ideal for the high volume grinding of green tea which is popular both as a beverage and for use in confectioneries too. The fine grinding and low heat generation of the Micron Glacis GC produces a tea with good mouth feel, texture, taste and mellow flavour. The Glacis is able to achieve a high cooling efficiency (7.5 times more than the conventional mechanical mill) by running coolants through the outer liner and grinding rotor. The Glacis can ultra-fine grind low-melting point, heat-sensitive materials that we impossible with conventional units. The Micron Glacis GC offers the particle grinding size accuracy of a jet mill (10 - 20µm) but with a higher volume capacity but with a 50% lower energy consumption. 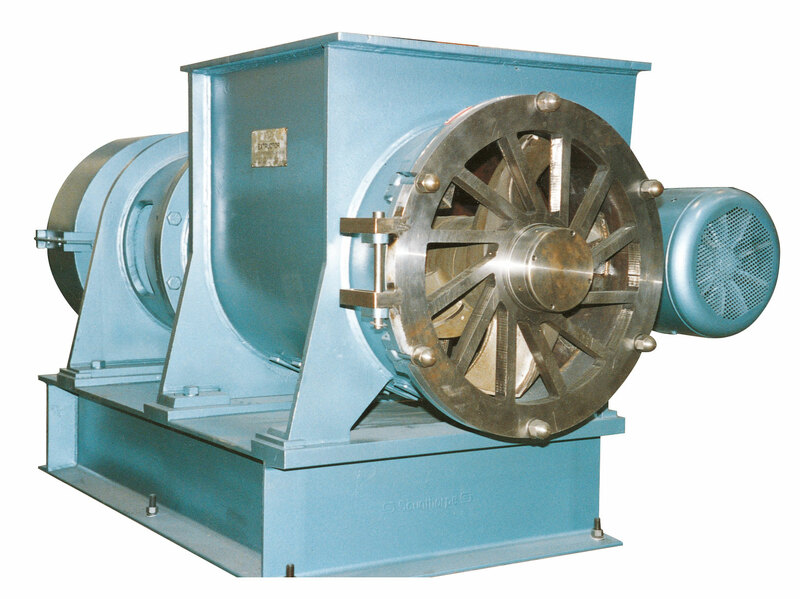 Material is ground by strong impact and shear force generated at the space between the grinding rotor and the liner. Both the grinding rotor and the mill lining are specially designed with an effective cooling structure which alongside the reduced air volume required by the unit for cooling actively prevents product oxidation and therefore deterioration of the tea quality. The Glacis has a low air volume requirement relative to grinding power which means the additional auxiliary equipment such as the blower and bag filer can be scaled down, allowing for a compact installation. Capable of producing finer particle sizes than a jet mill and with energy consumption typically eighty percent less than other mills, the Pulvis offers an efficient alternative to impact type mills, when it comes to ultra-fine milling. As a dry agitated bead mill type, the Pulvis offers size reduction without the need for an additional drying phase. In the dry process particles do not re-agglomerate but remain in a dry, free flowing state, saving further energy costs and time. The mill is located at the bottom of the machine and ground particles are conveyed by air, passing through the grinding chamber to the integrated classifier the operating speed of which determines the fineness of the end product. 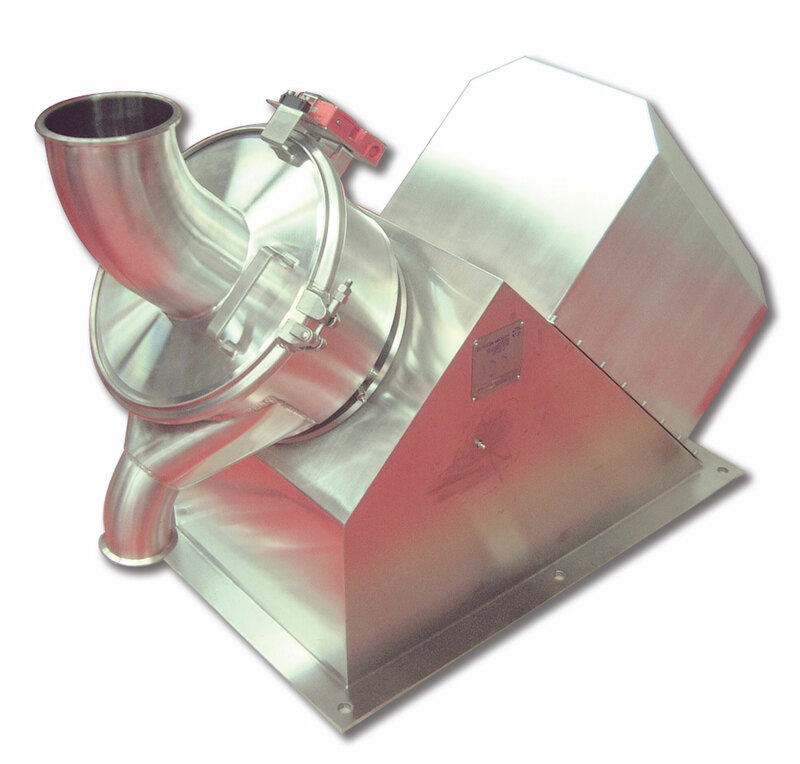 The classifier separates the required fine product from coarse particles. The coarse particles are returned to the grinding zone. With the option of ceramic, wear protected grinding and classifying parts the Micron Pulvis is suitable for milling ceramic materials, metal oxides, battery materials, minerals, glass, hydrogen absorbent alloys, magnetic materials, pigments and carbon etc. Designed for easy access, disassembly and cleaning the machine is well suited to multiple applications and frequent material changes. Available in a range of sizes from 0.75 kW grinding motor (1.00 kW classifying motor) to 70.0 kW grinding motor (30.0 kW classifying motor) the Pulvis is suitable for test purposes through to fully scaled up production size. ‘Nimble manufacturing is now one of the main factors driving purchases of Hosokawa Micron’s Flexible Compact Isolators (FCI),’ says Carl Emsley, Sales Manager at Hosokawa Micron Ltd. As manufacturers strive to meet rapidly changing customer demand, production agility and nimble response is vital and Hosokawa customers are confirming that their small footprint, plug and play, high containment isolators are just what they need. ‘The ability to quickly respond to changes in demand is increasingly being seen as the key to success in pharmaceutical, cosmetic, biotechnology and research markets. As companies strive to ‘stay ahead of the pack’ and get a lead on their competitors, our mobile, barrier containment, compact isolators are proving that they are definitely up to the task. They make it easy to have flexible containment exactly where and when it is needed. ’ With the ability to use one isolator unit for several different processes or to link individual units together to create a multi-process work pod, FCIs create a real flexibility and agility in manufacturing or research settings that is not easy to achieve with large or static isolators. Delivering high containment levels of 1µg/m³, Hosokawa FCIs can cope with a range of potentially hazardous products, protecting both personnel and products. With excellent all round visibility and a range of rigid, semi rigid or disposable canopy options which fit onto the stainless steel base unit, many customers see the benefit of ordering more than one canopy style, further increasing manufacturing flexibility. The plug and play mobility of FCIs means units can be wheeled to where they are needed. Relocation is quick and easy and allows maximum use of the resource. Based on traditional, Hosokawa Micron static isolator designs the FCI is both durable and economic and with shorter manufacturing lead times it offers an ideal solution, particularly for test type applications, start-up companies or those for whom handling of hazardous powders is infrequent or when investment in a dedicated, static isolator, is not appropriate. The Hosokawa FCI can be tailored to suit customer requirements including air handling systems, CIP system, filtration and rapid transfer ports, nitrogen inertion, flexible glove port configuration and hazardous area systems. Hosokawa Micron can also offer a range of processing and packing equipment specially engineered in miniature for use within the Hosokawa Micron FCI. Hosokawa Micron Ltd announce the launch of a new ‘twin, buggy filling and weighing, containment booth’, designed to handle safe, easy and accurate FIBC filling. Designed in co-operation with a leading detergent manufacturer, to meet the demands of the high volume product transfer of potentially sensitising powders, the containment system is uniquely configured for automated filling of FIBCs located on a wheeled buggy frame. The booth is connected to the customer’s HVAC system to generate a horizontal laminar airflow which captures airborne particulates generated in the filling operations. The contaminated air is then extracted through the combined booth plenum to a remote filtration system. Double opening doors at the front of each booth allow easy access for the manual loading of the FIBC buggy. As the buggy is pushed into position the FIBC lid is automatically lifted, eliminating the need for an operative to undertake this procedure by standing on a step ladder. Guide rails ensure accurate positioning beneath the downward sealing filling head. Once the buggy is in position (defined by a sensor) a mechanic clamp device holds the wheeled buggy in place. Doors are interlocked to prevent unauthorised entry whilst filling operation takes place. On disengagement and removal of the buggy from the filling and weighing system, the FIBC lid is closed. Accurate filling and weighing is controlled from outside the booth and once filled the FIBC buggy can be wheeled away with operatives protected from potentially sensitising or hazardous, residual airborne dusts. The booth incorporates a single rear, personnel door for safety and ease of all round access and maintenance. 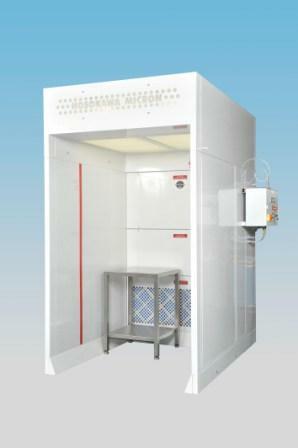 The booth is equipped with integrated weigh scale, internal lighting and integral dust monitoring system. With a high incidence of workplace risk from respiratory sensitising dusts from grains, flour, egg protein, fish protein and ingredient additives, Hosokawa Micron Ltd, a leader in containment technology has responded to food industry demands for improved and safe levels of personnel and product protection and by developing a range of modular Downflow Booths. Capable of delivering Operator Exposure Levels of <1µg/m3 the booths also provide product protection from surrounding area contamination by creating a ‘clean processing zone’ minimizing cross contamination risk from other products or processes. The Hosokawa Downflow Booths have been designed to meet key demands for energy efficiency, low running cost and low operating noise. Their cost effective yet flexible modular design makes them suitable for a range of applications when it is necessary to undertake processing steps outside of a closed food processing machine, such as sampling, filling or packing operations. The low running costs of the booths can be attributed in part to the incorporation of highly effective and energy efficient motors and fans. Hosokawa Micron Ltd is your single source for integrated powder processing systems and containment solutions. Our core products and services include particle design for nano technology, size reduction equipment, mixing systems and drying equipment, air classification and compaction technology. Furthermore Hosokawa's comprehensive range of containment solutions including gloveboxes and down flow booth caters for every requirement. Hosokawa Micron now offer a new performance improvement service which is an on line health check for plant and process for new and existing systems which can pay for itself. We also have an in house test centre offering flexible multi-stage toll processing options from single stage production to integrated milling and mixing classification. With over 500 machines available we have industrial experience in many industries including pharmaceutical, chemical and food. Hosokawa Micron Ltd specialise in powder and particle processing, micro nano technology, hygienic filling and weighing, high containment and plastics processing equipment, for a wide range of industries including chemicals, food, pharmaceuticals, minerals, toners, metal powders, pigment, powder coatings and ceramics. 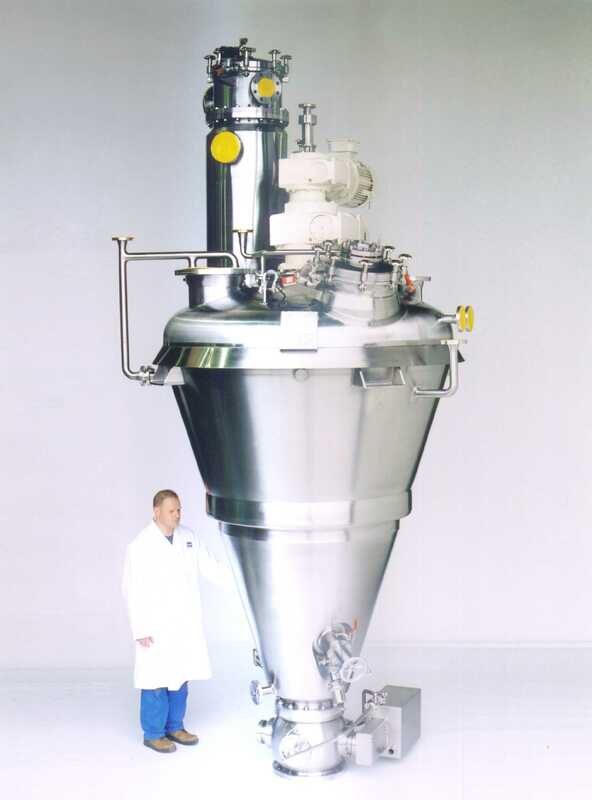 Our machine technologies include mixing and drying, wet and dry size reduction equipment ranging from micronisers to granulators, agglomeration and compaction, air classification and sieving, high containment isolators/downflow booths and hygienic filling and weighing systems. With our technical expertise and knowledge, we can provide a full design, build, installation, commissioning and after-sales service for single machine supply, to typical projects ranging from small R&D/pilot plant packages to full turnkey installations backed by the global resources of the Hosokawa Micron Group.